Sometimes, it only takes half an hour for magic to happen in the kitchen. It took only half an hour for these gorgeous, but sadly hum-drum tasting peaches to be transformed into the multi-layered, golden deliciousness of peach jam. If I hadn't prepared it myself, I would not have believed that such a transformation was possible, aided only by some lemon juice, sugar and a few drops of vanilla and almond extracts - but indeed, it happened, and I'm here to tell you that I've found the answer to all that sad, tasteless fruit that all of us come across but feel too guilty to throw away. I have to admit that real jam-making isn't (yet) for me. The thought of buying up large quantities of fruit, simmering it in a large pot (which must feel a bit like a Macbeth witch, I'm imagining) and then *shudder* sterilizing the cans properly just really freaks me out. This, however - this is easy peasy. Let's say that, like me, the peaches you bought aren't all that you thought they would be. Or you found some strawberries in the back of the refrigerator that look like they've seen better days. You just take this neglected fruit, add some lemon juice, sugar and some extracts, simmer a bit on the stove and watch the magic happen. I promise you, it's a darn good show. 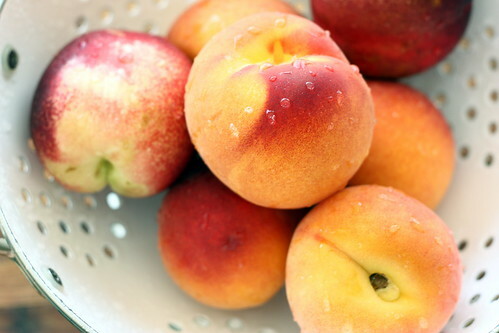 Slice peaches thinly and, in a large bowl, combine with lemon juice, sugar and extracts. Stir to dissolve sugar and leave in the refrigerator to macerate overnight [I left mine in there for an hour]. Drain out all the juices into a heavy-bottomed sauce pan. Add half the fruit, bring to a boil, reduce the heat to low and simmer for about 15 minutes, until the juices are just thickened. Cool it down for 10 minutes, then transfer to a food processor or blender and puree until smooth. Transfer back to the pan and add the rest of the fruit. Bring back to a boil, then reduce the heat to low and simmer gently for another 15-20 minutes. To test if the jam is ready, drop a heaping teaspoonful onto a plate and slightly tilt the plate. The jam should not run off, but cling and slowly glide down. If the jam isn’t ready, put it back on the heat for a while. Spoon the jam into small jars and refrigerate or spoon into resealable plastic containers and freeze. You need to keep it in the fridge and use it up fairly quickly [but I guarantee that this will not be a problem - it's DELICIOUS]. I red about freezing jams for the first time today. Now you are mentioning it, too. Peach jam is one of my favorite. Thanks. 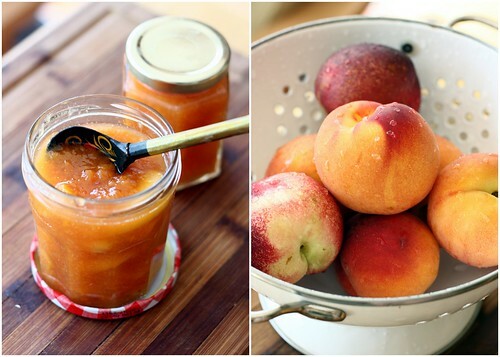 Your peach jam looks delicious! Also, you made REAL jam! You're just saying you don't want to get into the preserving/canning process. Though the two practices almost seem intertwined as one, they aren't. You should try making some jam on a cold winter day--the heat of the stove will help keep you warm, and the tastes will bring some summer to your days. Blueberry preserves is an excellent one to do, especially since (in California) you can't really buy fresh wild blueberries, and must resort to frozen. The peach jam looks wonderful! 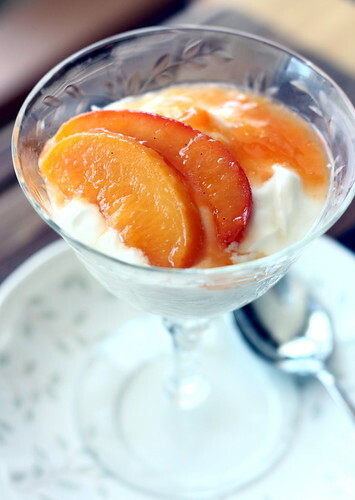 How great that you could turn the recipe on its head and swap out strawberries for the peaches. 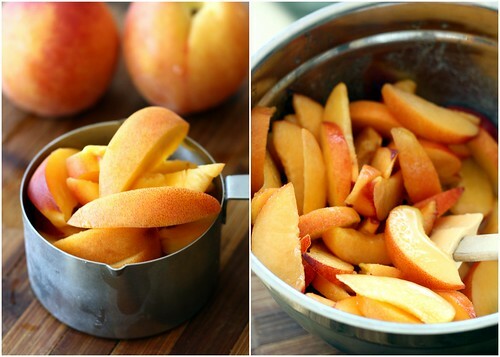 Beautiful pictures and a lovely idea for using up peaches. Wow that looks good. The peaches will be out here in another month or so and I'll definitely have to give it a try. Wow - I'm impressed. What a lovely way to use up fruit. I'm with you as far as not being crazy about the idea of making a huge pot of old-fashioned jam. It is indeed a lot of work. But this quick substitute has a lot of appeal--fresh, bright, and hassle free. Your photos, as always, are just gloriously beautiful. I love them. Yep, I also like to get the most use out of every food that comes into my kitchen. I freeze fruit in various forms as they come into season all summer. That way there's always a special treat on the oatmeal all winter. We get fruit from a CSA in our area every week. I found your site and we had some peaches that we were going to have to use quickly or toss, so we chopped them up and did as your recipe states and put them in the fridge and going to cook this up tomorrow. There are two of us and small batches work the best. I am looking forward to seeing how this turns out! this looks delicious and I love the ingredient choices, though I will go full scale and can them. The process really is not that hard, I just heat the jars in the oven to 200 degrees and put the hot jam in them. They will seal no problem and the acidity from the lemon juice takes car of any bacteria problems you would have had. No boiling necessary . . . This looks delicious! It also helps that I love my peaches! I just found your recipe and it is amazing! I almost did not add the almond extract but did at the last minute. I am ahppy I added it.